Treatment of shoulder, spinal, sacro-iliac pain and sporting injuries. 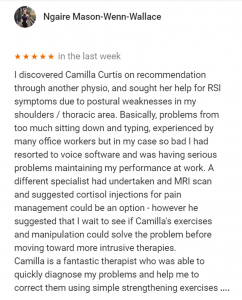 Camilla has a holistic approach to assessment of her patients and addresses biomechanical issues to include poor alignment and movement control when managing conditions both locally and globally. She is passionate about integrating manual therapy and rehabilitation treatment strategies including Clinical Pilates techniques with a strong functional bias to achieve lasting results. 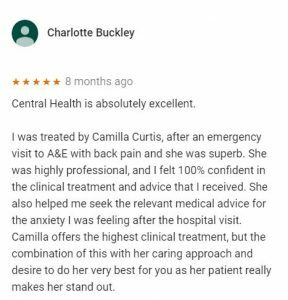 Over 25 years’ experience as a musculoskeletal physiotherapist in both the NHS and private sector in both the UK and Australia. 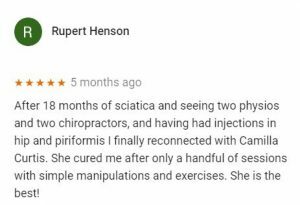 In 2002, she set up a highly-regarded physiotherapy practice in Kensington and subsequently sold it in 2013. 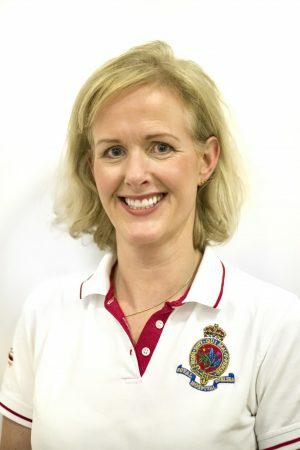 Extensive experience in the treatment of sports injuries to include working as Honorary physiotherapist to the Great Britain Paralympic Swimming Team 1997-2001 attending Sydney 2000. Recommended practitioner in the treatment of Pelvic Girdle Pain by the Pelvic Partnership Charity. Teaching experience to include: McConnell Tutor on Shoulder and Patello-femoral Courses to physiotherapists throughout UK and Honorary Lecturer on the Shoulder Complex to UCL/Kings College Physiotherapy Masters Students. Acting as clinical tutor and examiner for Physiotherapy Masters Students on placements. Camilla enjoys tennis, Pilates, skiing, running, photography and travel as well as using her knowledge of anatomy in life drawing classes! All of the physiotherapists at Central Health Physiotherapy are members of The Chartered Society of Physiotherapy and registered with The Health Professions Council. 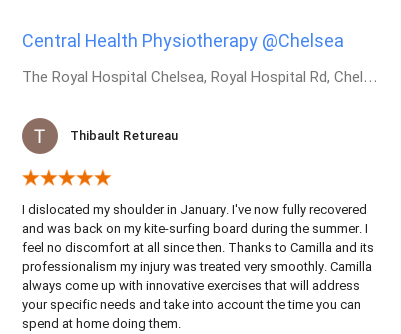 With approximately 60 staff, Central Health Physiotherapy has a substantial base of experience and encourages the exchange of knowledge and ideas. Physiotherapists are available to ensure service cover 52 weeks of the year.